We love this time of year in Australia when all of the summer fruits are ripening providing an abundance of fresh produce for snacking, cooking and preserving. The mulberry tree in the ELE garden is laden with so much fruit and despite the birds best efforts we have more mulberries than we know what to do with. We are also a big fan of simple-to-make, rustic fruit tarts and pies so a mulberry tart was the perfect solution to use up some of this delicious fruit. 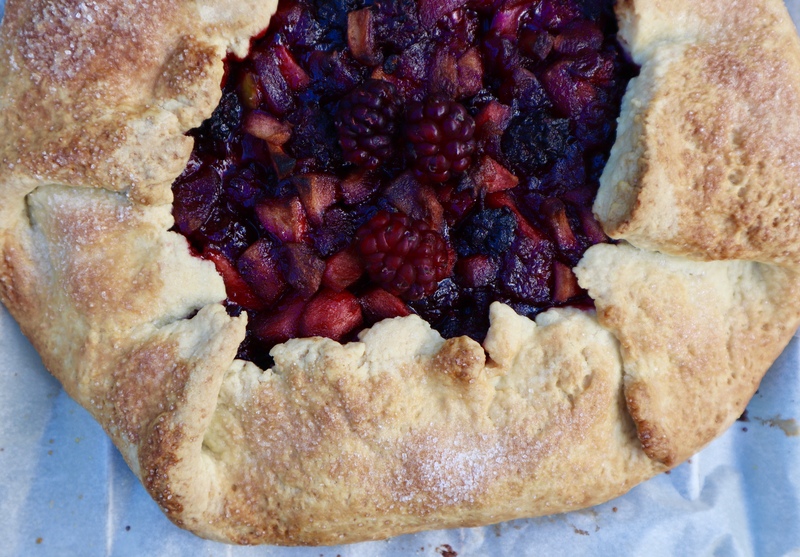 Mulberries are a little more sharp in taste than raspberries or blackberries so we like to mix them with sweet juicy green apples for a perfectly sweet and delicious tart that everyone will love. If you are picking mulberries straight from the tree be warned, they stain everything. Fingers, hands and clothes – we made the silly mistake of wearing white trainers while picking the fruit for this tart and now have lovely pink trainers! There are a few simple ways to avoid the pink stains – wear disposable gloves when picking and preparing the fruit or when mulberries are in season try placing a tarp or fine net on the ground under the mulberry tree and let the berries fall overnight, collecting the delicious ripe fruit in the morning. Our resident puppy dog Ellie, also has a fondness for the berries and we often find her wandering around the garden with bright pink paws! We use our classic rustic homemade pastry recipe for this tart, it never fails us and is very simple to make with no blind baking required. Heat oven to 180 degrees Celcius (350 Fahrenheit). To make pastry rub butter in to flour, sugar and salt until large crumbs form. Sprinkle with chilled water and mix in to a rough dough. Transfer to a floured board and knead for about 2-3 minutes. Roll out flat in to a circle shape approximately 16 inches in diameter and 1/4 inch thick. Lay pastry flat on a sheet of baking paper on a baking tray. To make the filling, peel and core apples and cut in to 1cm pieces. Add apples, sugar, honey and water in to a saucepan and simmer over a low heat for about 20 minutes until apples are lovely and soft. Add in mulberries, stir through gently and cook for a further 1-2 minutes. Remove from heat and allow to cool slightly. Spoon the apple and mulberry mix in to the middle of the pastry , leaving about a 4 inch border at the edges. Fold the pastry in from the sides to form the tart casing. Using a pastry brush to brush the edges of the pastry with milk and sprinkle with a little extra sugar. Place tart on a baking tray and bake in oven for 50-55 minutes until the tart pastry is golden and the mulberry mix is bubbling. Remove from oven and allow to cool slightly. Serve with double dollop cream. Enjoy! Love rustic tarts? Click here for our Rustic Tomato Tart and here for our Rustic Apple and Raspberry Tart. We think they do too!